First Floor: 1800 Sq. Ft.
Width: 63 Ft. 8 In. Depth: 55 Ft. 8 In. Maximum House Height: 23' 6"
This unforgettable design offers storybook charm in a modest living space measuring 1,800 square feet. 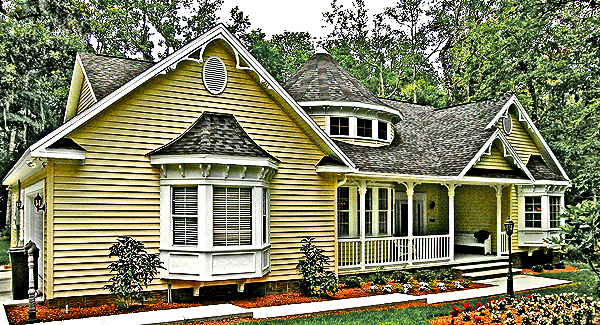 The exterior shows off a cute front porch, a striking turret, and fancy detailing. Perhaps the highlight of the well-planned interior is the dining room, with its multiple windows and curved shape. After dinner, invite your guests to step out back to the second porch for dessert and stargazing. You can see why this is one of our best-selling house plans.